I guess this must be how the Sounds of Silence looks like. A bright new day , filled with expectations , almost on top of the world. The story behind "Climbers near third step on Everest"
The sun had just come up and I stopped to wait for Thomas and the Sherpas who were close behind me. Their silhouette against the skyline at about 8700m altitude was stunning and I quickly took my camera out of my down suit and snapped this shot. My friend Sherpa Pemba leading as agreed, with Thomas just behind, still looking strong and approaching a lone deserted oxygen bottle while the sun had just risen above the seas of clouds over the Tibetan Plateau. 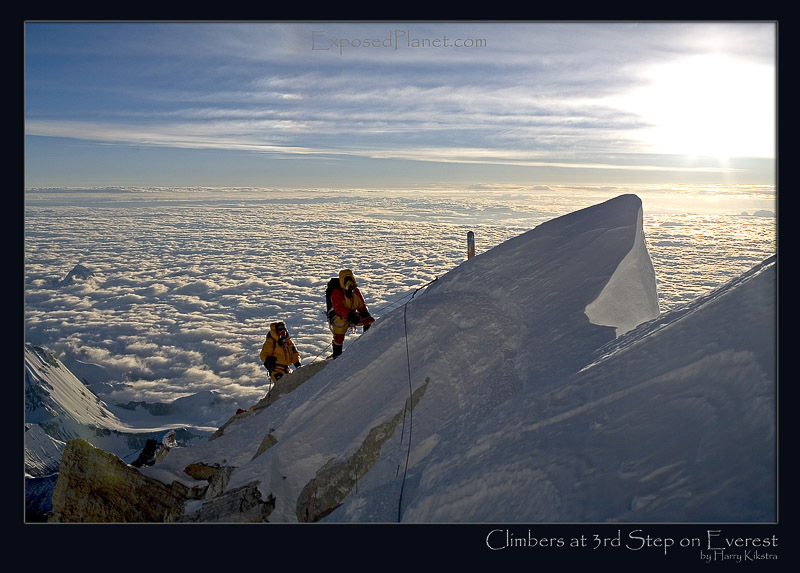 This is one of the last pictures taken of Thomas Weber, my client on Everest in 2006. A few hours later he had passed away at during the descent, at the bottom of the second stop, a steep rock passage a few hundred meters from this spot. This image only gives the beauty of this harsh place where humans are not supposed to be, the danger is hidden, a reality that has been proven every year with fatal results. The Death Zone is called that way for a reason. If you have to ask the question, you won’t understand the answer..